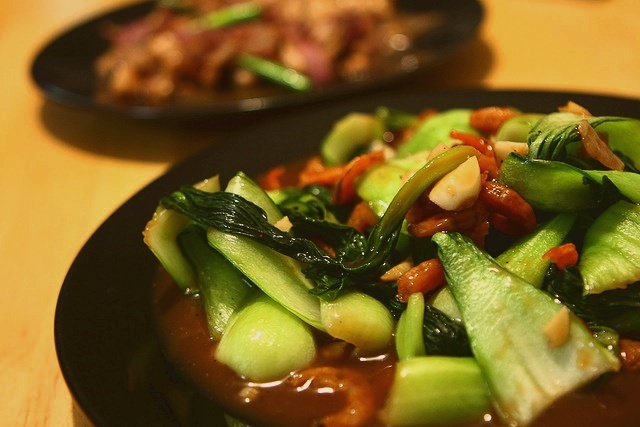 Bok Choy, the common Chinese cabbage, is popular in all Chinese cooking. Readily available in Asian markets and supermarkets, it can be served as an accompaniment to a meat or poultry dish, or as a dish on its own. Using a pestle and mortar, pound garlic, ginger and chillies to a paste. Add dried shrimp and pound them to a paste. Beat in shrimp paste and bind with a little oil. Heat remaining oil in wok or a heavy-based saucepan. Stir in spicy shrimp paste and cook over low heat for 2-3 minutes until fragrant and beginning to colour. Stir in sugar and soy sauce until well mixed. Add bok choy, tossing it around pan to coat leaves in spicy juices until they begin to wilt.